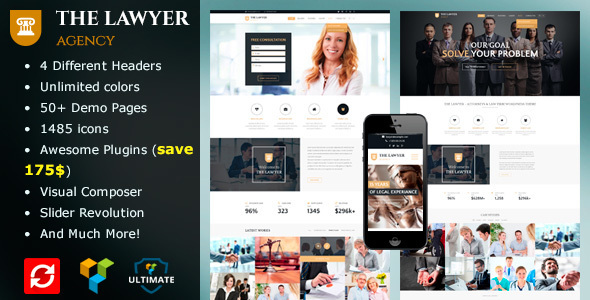 RTL Ready Premium Lawyer WordPress Theme The Lawyer is a premium lawyer WordPress theme developed by SecretLab. This theme is perfect for any law firms, attorneys, or legal experts who wants a professional online presence with a selection of premium features to boost their brand image. The Lawyer is a powerful theme that is compatible with WordPress 4.1+ as well as WooCommerce 2.1+. The theme features a one-click demo installer and you will receive reliable support and free updates as part of your purchase. The theme is for Advocates, Lawyers, Law Firm, Law Advisers, Attorneys, Jurists, Solicitors, Legal Officers, Barristers, Consultancy, Consultant, Consulting Business, Finance, Solicitor, Counsels, Accountants, Law Company. Compatible with WooCommerce 3.3.x, WooCommerce 3.2.x, WooCommerce 3.1.x, WooCommerce 3.0.x, WooCommerce 2.6.x, WooCommerce 2.5, WooCommerce 2.4.x, WooCommerce 2.3.x, WooCommerce 2.2.x, WooCommerce 2.1.x, Visual Composer 4.11.2.1, Visual Composer 4.11.x, Visual Composer 4.9.x, Visual Composer 4.9, Visual Composer 4.8.x, Visual Composer 4.7.4. The Lawyer has been tested with browsers IE11, Firefox, Safari, Opera, Chrome, Edge.